The son of Betty and Joe G. Bourne, Lin was born Dec. 23, 1948, in Billings. 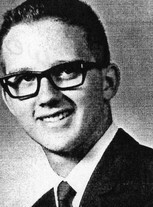 He attended North Park, Burlington and Lewis & Clark schools, graduating from West High in 1967. Following high school, Lin entered the Army, serving in the Vietnam War. He was awarded the Bronze Star and was honorably discharged in 1970. After returning to Billings, Lin worked for Conoco Refinery a short while before going to work for Linscott Construction. He spent eight years with Star Office Machines as Service Manager. Lin has served with the National Guard since 1991 and was a staff sergeant at the time of his death. Lin married Lietta Reiss in 1984. The love of his life, his daughter Brenna Renee Bourne, was born in 1989. Lin's interests were vast. He loved history, nature, and everything educational. He was very bright, talented and artistic. Lin's talents knew no limits. He built many beautiful things with his hands. He loved helping family and friends with construction projects. He was a very devoted husband, father, son, brother and friend. Lin was especially known for his wonderful sense of humor and " made people laugh."